Tag Archive | "Gabby Olvera"
This pickup truck rolled Friday morning, June 10, injuring the female driver and two young passengers. A woman and two children were sent to the hospital on Friday morning, June 10, after their truck rolled on 17 Mile in Solon Township. 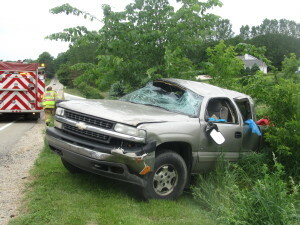 The crash occurred shortly before 10:30 a.m., in front of 1750 17 Mile Road, east of Lime Lake Rd. According to Joshua Roney, of Kent City, he was heading westbound on 17 Mile in his Ford F350 pickup, and was turning left into the driveway, where he works, when another pickup behind him tried to go around him and clipped his back bumper. “She was going way too fast,” he said. The other pickup then rolled. The call came into 911 saying passengers had been ejected. According to the Michigan State Police, a young female passenger, Gabby Olvera, 9, of Kent City, was ejected. The other two, driver Debbie Monroe, 58, of Sparta, and a young male, Gustafo Olvera 10, were not ejected. According to Lt. Chris Paige, with Solon Fire and Rescue, the female driver, grandmother of the two children, was transported to the hospital by Rockford Ambulance with serious injuries, and the two children were transported with non-life threatening injuries. The Michigan State Police said that the Monroe was cited for being unable to stop in an assured clear distance. Assisting the MSP at the scene was the Kent County Sheriff Department, Solon Fire and Rescue, Algoma Fire and Rescue, and Rockford Ambulance.